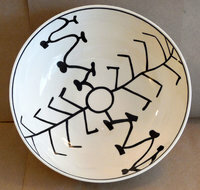 This bowl was inspired by an early Mesa Verde Black-on-White bowl with corn plant design from a site north of Durango Colorado. The actual pot is housed at the Chapin Mesa Archaeological Museum in Mesa Verde National Park. Lead-free, microwave and dishwasher safe. Approximately 9" in diameter and 2.75" deep. Handcrafted by Designs by Anna in Durango, Colorado. 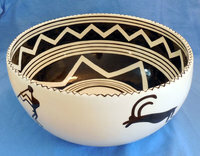 This large bowl was inspired by a Mesa Verde Black-on-White pot housed in the Mesa Verde Chapin Mesa Archaeological Museum. 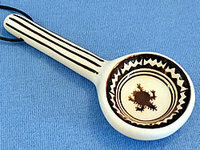 Kokopelli, the flute player, is the most well known petroglyph in the southwest and ocassionally depicted on pottery. Kokopelli is thought to influence germination and production of large families. Lead-free, microwave and dishwasher safe. Approximately 9.25" in diameter and 4" deep. Handcrafted by Designs by Anna in Durango, Colorado. 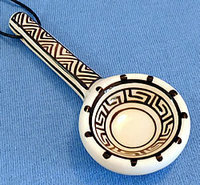 Inspired by a Mesa Verde Black-on-White pot housed in the Mesa Verde Chapin Mesa Archaeological Museum. 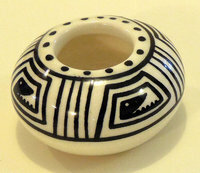 This bowl has classic Mesa Verde banding and solid kiva step motif and embellished with a turkey. Besides the dog, Ancient Puebloans also domesticated the turkey. Lead-free, dishwasher and microwave safe. Approximately 6" in diameter and 2" deep. Handcrafted by Designs by Anna in Durango, Colorado. 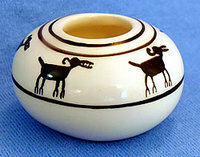 This miniature reproduction was inspired by a Mesa Verde Black-on-White bird effigy housed in the Chapin Mesa Archaeological Museum in Mesa Verde National Park. The name has been applied to these Ancient Puebloan jars because of their bird-like form. Some bear a striking resemblance to certain kinds of birds, such as ducks and doves. The function of these vessels is still unknown. Approximately 3.5" x 1.75" 1.75". Handcrafted by Designs by Anna in Durango, Colorado. This piece is a miniature reproduction of a Mesa Verde Black-on-White effigy housed in the Chapin Mesa Archaeological Museum in Mesa Verde National Park. This effigy may be one of the most iconic pieces of pottery found in the Chapin Mesa Archaeological Museum! Animal effigy forms are unusual in Mesa Verde. This effigy bears a striking resemblence to a sheep or ram. The function of these vessels is still unknown. Approximately 4" x 1.75" x 1.75". Handcrafted by Designs by Anna in Durango, Colorado. This piece is a miniature reproduction of a Mesa Verde Black-on-White bird effigy housed in the Chapin Mesa Archaeological Museum in Mesa Verde National Park. The name has been applied to these Ancient Puebloan jars because of their bird-like form. Some bear a striking resemblance to certain kinds of birds, such as ducks and doves. The function of these vessels is still unknown. Approximately 4" x 2.75" x 1.75". Handcrafted by Designs by Anna in Durango, Colorado. 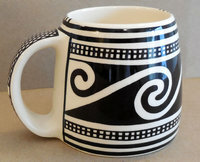 Inspired by a Mesa Verde Black-on-White mug housed in the Mesa Verde Chapin Mesa Archaeological Museum exhibit "Black on White Masterpieces". 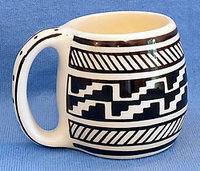 This mug has classic Mesa Verde banding and solid kiva step motif. The meaning of keyhole handles, like the doorways, is still unknown. Lead-free, microwave and dishwasher safe. Approximately 3.5" in diameter and 4.5" deep. Handcrafted by Designs by Anna in Durango, Colorado. 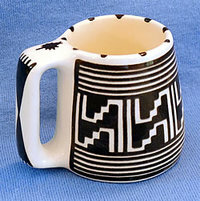 Inspired by pottery made by the Ancestral Pueblo people this mug is an artistic replica of a mug embellished with a small zoomorphic applique that resembles a Mountain Lion Head. Lead-free, microwave and dishwasher safe. Approximately 2.5" in diameter and 3" deep. Handcrafted by Designs by Anna in Durango, Colorado. 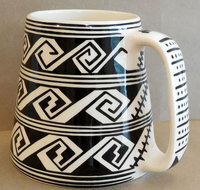 Inspired by a Mesa Verde Black-on-White mug housed in the Mesa Verde Chapin Mesa Archaeological Museum exhibit "Black on White Masterpieces". 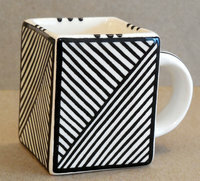 This mug is an artistic replica of a mug with an interlocking scroll design from Mug House in Mesa Verde National Park. Mug House was so named because four or five mugs were found tied together with strings through their handles. Lead-free, microwave and dishwasher safe. Approximately 2.5" x 3". Handcrafted by Designs by Anna in Durango, Colorado. 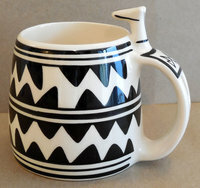 This full sized reproduction was inspired by pottery made by the Ancestral Pueblo people. 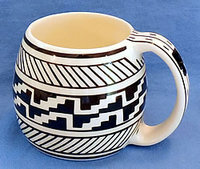 This mug has classic Mesa Verde banding and solid kiva step motif. Kiva steps are believed to be the porthole to the underworld. Lead-free, microwave and dishwasher safe. Approximately 4.5" in diameter and 5.5" deep. Handcrafted by Designs by Anna in Durango, Colorado.